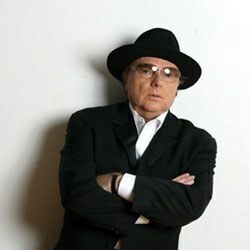 Van Morrison takes us on the simple route to salvation. 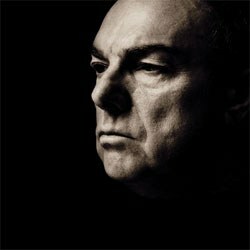 On his albums, Van Morrison has presented enough personas over his 40-plus-year career that some ambitious film director could riff on them as easily and fruitfully as Todd Haynes did on Dylan’s for I’m Not There. Van Morrison is a poet, an Irish folkie, a philosopher, a mystic, a showman, and a teenager-at-heart still dreaming of the R&B records he heard on the radio decades ago. In recent years, he has become a bluesman, complete with hat, sunglasses and deep voice. Or a cool-as-cucumber jazzy blues vocalist, at least. On his latest album, Keep It Simple, Morrison is somewhere between that jazz-blues cool cat and the head-in-the-clouds poet/philosopher of Astral Weeks, et al. For a stretch near the start, he almost literally switches back and forth, adopting a standard blues form nearly every other song. On the title track, he sings of being caught between the cold, hard reality of life and “pipe dreams”. Musically he’s in similar territory this time, halfway between the blues’ reality and the idle dreaming of a pop melody strummed on an acoustic guitar. In both cases the music is relatively simple, as the title promises. The instruments are few, and sparsely presented. That makes a banjo stand out nicely in a few places, strings in others. A few sharp guitar solos are also memorable, and an organ runs through much of the album, sitting comfortably within the blues songs, but also giving the other tracks a complementary glow. This more minimalist approach highlights Morrison’s band’s playing while also keeping his voice always the center of attention. The songs themselves are simple enough to do this as well. No busy arrangements or constructions distract from the central show of Morrison taking a humble little song and singing it. As Morrison has aged, the enunciation in his singing has grown less distinct. On previous albums in the past decade, and definitely during live performances, it has sometimes seemed like he was mumbling and slurring his way through whole songs. That is mostly not the case here, though he does blur lyrics together in a place or two. 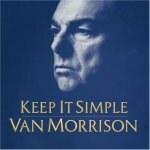 Most of the time on Keep it Simple, his singing is worthy of its place at center stage. On “Lover Come Back” and “That’s Entrainment”, he sounds especially good, singing not just clearly, but with that ancient soulfulness that is his hallmark. Partly because of the singing, “That’s Entrainment” immediately stands out, one to add to the lengthy list of classic Van Morrison songs. The third track, it’s the first riveting moment of the album, possibly the first from Morrison in a while, where he holds time still like he used to. He starts singing right at the song’s opening seconds, painting a picture of a countryside, then of himself standing in rapt fascination, struck by the pure beauty of an unspecified “you”, seemingly the spiritual force of nature, but sung to like a lover. Handclaps and other hand percussion provide the song’s backbone, as Morrison sings up and down the hills of that countryside, eventually expressing his awe in the terms of classic R&B -- when “you” come around, it makes him holler, makes him want everyone to shake their collective moneymaker, shake it on down. At first the chorus of “That’s entrainment” is jarring amidst all this ecstasy and calm, if only because it begs the question, “What the hell is entrainment?” As far as I can tell, it’s all about being drawn in and transformed, the way air forms into a cloud. Throughout the album, there are moments like this where Morrison’s clearly reaching at, or celebrating, something ineffable and inspiring. But he never goes at it quite as overtly or potently. Most of Keep it Simple has a demeanor of ease to it. He writes a couple blues songs, standard in form, and enjoys laying them down with his friends. He writes a simple ‘return to me’ song to a lover, calls it “Lover Come Back”, and stretches it out over five minutes, singing it with drama, but no urgency. While the songs strive towards familiarity and comfort in their form, Morrison does something similar with the lyrics. Whether singing with yearning about the way the world has changed, or tackling something less serious, he keeps relying on simple rhymes and familiar phrases. “One monkey don’t stop now show,” “I was educated by the school of hard knocks,” “got to run / towards the setting sun.” But despite one song, “Don’t Go to Nightclubs”, that essentially takes “Don’t Get Around Much Anymore” and turns it slightly, and another song, “Soul”, that is a walking cliché carrying an air of sincerity about it, you generally get the feeling that the clichés are here on purpose. When during the first song, “How Can a Poor Boy”, Morrison sings, “Tell me what evil lurks in the hearts of men / only the Shadow knows,” he’s obviously up to something. He’s not being lazy; he’s using the familiar to get to something deeper. It’s the last song, “Behind the Ritual”, where he makes that crystal-clear. The song takes the feeling of comfort behind the album and falls back into it like a bubble-bath, indulging. No longer trying to hold the spotlight, Morrison sings like he’s musing to no one in particular, thinking aloud about “drinking wine in an alley / making time / drinking that wine / in the days gone by.” He turns these words into a circling refrain, as the musicians play along. “Talking all out of my mind,” he sings, eventually emulating that with a whole string of “blah blah blah blah” nonsense words. But before he gets there, he sings his mission statement, spells it out: “Behind the ritual / you find the spiritual.” In one fell swoop, he links communion wine to a wino’s bottle in a paper bag, and highlights the meaning behind the album’s gravitation towards the familiar. Perhaps Keep it Simple is an exercise in going through the motions to get to the spiritual, using the everyday to illuminate the transcendent. As Morrison puts it right there in the title track, “We’ve got to keep it simple / and that’s that.” But of course it’s more than that. Even by the end of that song, he explains that keeping it simple is what we need to save our selves.